What’s happening in Greece? News from the front lines of Europe! Summary: The euro crisis began 30 months ago. The cheers for each new solution proved unwarranted. Likewise the fears of the skeptics, as the periphery nations have held together under horrific stress. So far. Here we look at public sentiment in Greece. See the For More Information section at the end. Soon: the Golden Dawn of Greece! My guess: Europe’s leaders continue their program of austerity plus government loans. They see this as penicillin. In fact it’s a toxic brew of hemlock and morphine. Europe’s economies will continue to deteriorate, but the political situation will remain stable until social cohesion breaks somewhere. 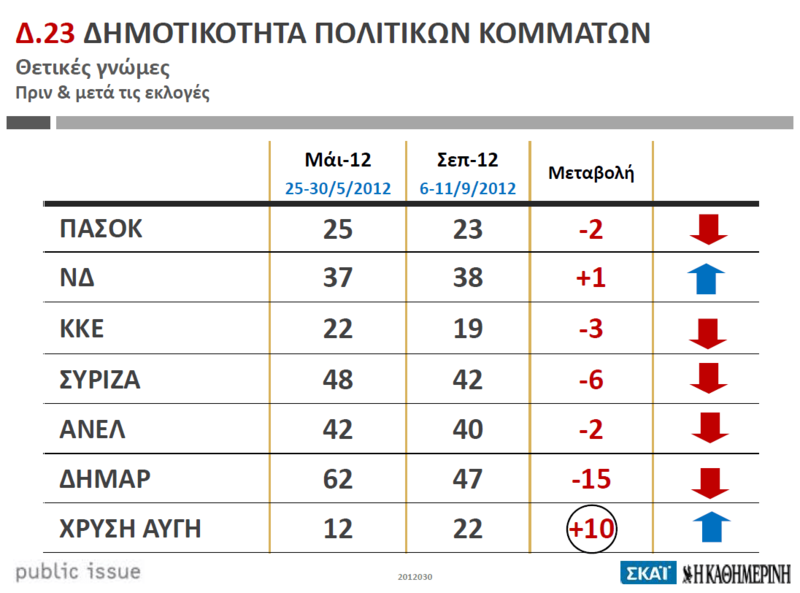 This poll gives us a status report from Greece. Even there a majority remain loyal to the great unification project (which US conservatives falsely describe as forced upon Europe by its elites). But as the depression deepens, an increasingly number of defectors give their loyalty to extreme parties. Greece and Spain are the fault lines; watch there for something to snap. 54% of respondents stated that they do not trust any party. … With regard to the Memorandum, 68% opposed the Memorandum and 21% favor it. 9% believes that compared with a year ago, our country’s position in the world became stronger. The corresponding rate in May was 5%. In contrast, 60% consider that the position of our country became weaker, while 31% believe the country’s position remained the same. Still, 46% considered unlikely to bankrupt the Greek state in the next 12 months compared to 47% in July and 38% in May. … About the European Union, 52% declare it positively and 44% negatively. … Also, 67% of respondents have a positive opinion about the euro, compared to 72% in July and 77% in May. Negative opinions about the common currency increased to 31% in September, from 26% in July and 22% in May. … The survey was conducted during the period 6-11 September 2012. I don’t know what this graph is measures, but the trend can’t be good. PASOK is the first listed; Golden Dawn the last. Perhaps this will be biblical: the last will be first. (b) See all posts about Europe on the FM Reference Page Europe – on the road to division or unification. It’s certainly puzzling how committed the peripheral countries’ populations seem to the European unity notion despite the fact that people in Greece are now committing suicide due to lack of food, basic access to medical care, absence of jobs, etc. It’s now been more than 4 years since the global economic collapse and in Europe things have gone from bad to worse. By this point in the 1930s, extremists had taken control in both Russia and Germany and Spain. Any explanation for why the governments of Greece and France and Spain and America haven’t yet fallen? Mainstream media in Greece presents an exit from the Euro / EU as an apocalyptic scenario. If it weren’t for the element of fear that’s been manifested by this, statistics would be different. That’s great point! Massive propaganda has convinced many in Europe that the consequences of breaking the European Monetary Union would be horrific for all. Equally so the effort to hide from them the success of Iceland and (before that) Argentina — their successful use of devaluation and default. It’s just so tragic. The people are being crushed to save the bondholders and the banks. With every new bailout and agreement, the vice squeezes a little tighter. Look at this. Youth unemployment rate from age 15-24. Finland it shows 17.7% youth unemployment, which matches what I’m hearing. The job situation in Finland is not very good. 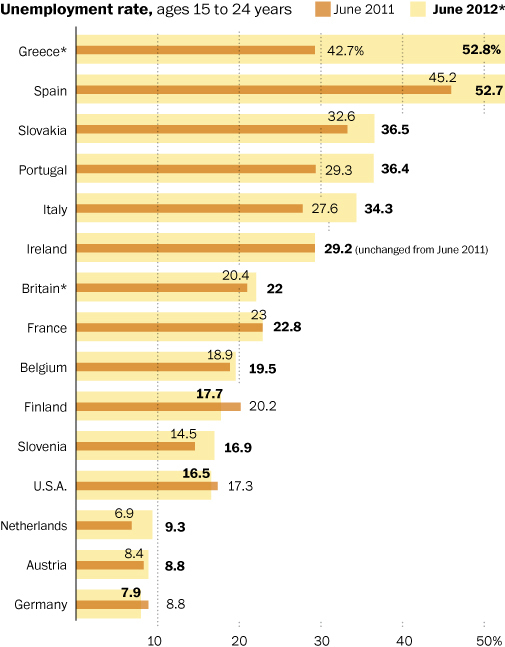 But Greece at 52.8% youth unemployment? Spain at 52.7%? This is the employment apocalypse. The monetary crisis in Europe is caused mainly by the structure of the Euro itself. In a European Union where the forced customers of the South have to actually borrow from the ECB (not their central bank) in order to finance imports from Germany, there was never a happy end-game for all. The South was from the beginning the safety buffer of Germany and other exporters of the North to keep China away from their back yard and their surplus. The East served as the cheap labour base for the German Industry. That was the plan from day one in the EU. All they are doing at the moment is slicing and dispensing of any Greek asset worth having. Are they worried about the Golden Dawn party? Not really. They should be worrying about whole Country populations going extremist. Yes. This was clearly seen at the start of the project, as seen by these economists: Can the European Monetary Union survive the next recession?, 11 July 2008. For a lot more analysis about this see the posts about Europe on the FM Reference Page Europe – on the road to division or unification. Nobody can accuse Portugal’s free-market government of failing to try. Premier Pedro Passos Coelho has gone beyond the demands of the EU-IMF Troika under the terms of Portugal’s €78bn loan package, winning plaudits from Europe’s austerity police and a pat on the head from Wolfgang Schauble. The Portuguese people have put up with one draconian package after another – with longer working hours, 7pc pay cuts, tax rises, an erosion of pensions, etc – all amounting to a net fiscal squeeze of 10.4 of GDP so far in cyclically-adjusted terms. (It will ultimately be 15pc). They have protested peacefully, in marked contrast to the Greeks, even though the latest poll by the Catholic University shows that 87pc are losing faith in Portugal’s democracy. Yet Mr Passos Coelho’s rash decision to raise the Social Security tax on workers’ pay from 11pc to 18pc has at last brought the heavens down upon his head. He was hauled in front of the Council of State – a sort of Privy Council of elders and wise men – for a showdown over the weekend. Eight hours later he emerged battered and bruised to admit defeat. The measure will not go ahead. Francisco Louca from left-wing Bloco suggested that the prime minister cannot survive such a defeat. “The government is dead”, he said. I leave it to Portuguese readers to tell us on this blog whether that is so, but what is clear is that Portugal is entering an entirely new phase of this crisis. There are bigger forces than governments. Mr Passos Coelho and his young puppies have come face to face with the Portuguese nation. Unemployment has reached 15.7pc (36.4pc for youth). Citigroup expects the economy to contract by 3.8pc this year, a further 5.7pc next year, and yet again by 1.3pc in 2014. (and even then the current account will still be deficit – proof of the absurdity of EMU) The slump will be so severe that the budget deficit will rise, not fall. Shrinking tax revenues will outweigh gains from cuts. Lisbon is chasing its tail. Citigroup says the deficit will be 5.1pc of GDP this year, 4.9pc next year, and 5.4pc in 2014. This will play havoc with debt dynamics. Public debt will explode to 134pc of GDP by next year. At which point there will have to be debt-restructuring. If Citigroup is right – and views differ on this – Portugal is going into the same sort of self-feeding downward spiral as Greece. Debt-deflation is choking the country. As readers know, I have never believed that Portugal is fundamentally healthier that Greece. Its total debt level is over 360pc of GDP (Greece is nearer 260pc). Its international investment position is over 90pc of GDP in the red. Portugal cannot recover under the policies in place. The government is asphyxiating the Portuguese economy for no useful purpose. It is pain without gain. Two weeks ago I was interviewed by the Catalan newspaper El Punt Avui. I said it would be unthinkable for the Spanish state to stop Catalan secession by military force. Such action would violate EU Treaties and lead to Spain’s suspension from the European Union. You do not do such things in the early 21st Century. “No pots ser membre de la UE si utilitzes la força” was the headline. I may have underestimated the vigour of the Spanish officer corps. First we have the robust comments of Colonel Francisco Alaman comparing the crisis to 1936 and vowing to crush Catalan nationalists, described as “vultures”. “Independence for Catalonia? Over my dead body. Spain is not Yugoslavia or Belgium. Even if the lion is sleeping, don’t provoke the lion, because he will show the ferocity proven over centuries,” he said. … Col Alaman is in a sense correct. The mood is becoming dangerous. Is case you think he is an isolated case, former army chief Lt-Gen Pedro Pitarch said his views reflect “deeply-rooted thinking in large parts of the armed forces”. Gen Pitarch said Catalan independence is out of the question, though he also said Madrid had bungled the crisis of the regions disastrously. “Are we looking at a failed state?” he asked. Fabius has probably mentioned this before but it bares repeating. 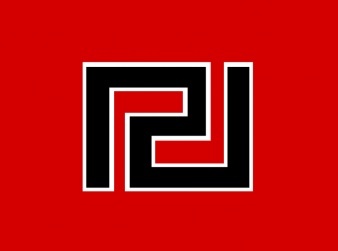 Has anyone noticed the painful irony of even a modicum of support for a fascist party (Golden Dawn) in Greece considering their occupation by Nazi Germany and Fascist Italy? I hadn’t thought of that! Hair of the dog that bit you? And even worse, there are Nazi groups in Poland and Russia, coutries which suffered even more than Greece from German occupation during WWII.